Note: There is a plant in Australia initially sold as aff. rangelensis, more recently it has been noted it is closer to trelawniensis. See notes below. Michael Mathieson 08/11/15 as T. rangelensis. This plant, about 15-20 cm diameter, has just flowered here in SE Qld, tagged T. rangelensis. It would be great to have another photo of this species in flower. Your plant does not tally with what I have on file - see rangelensis image and description below. 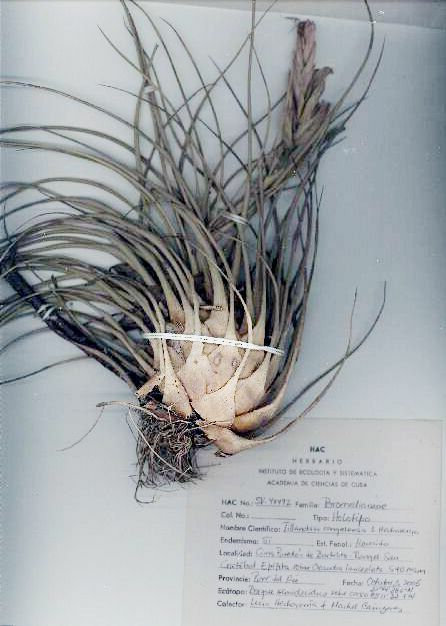 This plant is probably one I got from Selby in 1988 as a small form of fasciculata from either Jamaica or Dom Rep. I forget. Later Harry Luter id'd it as rangelensis then trelawniensis. It is really quite small (maybe 30cm all up in bloom) and will flower with a single spike from a smallish plant. 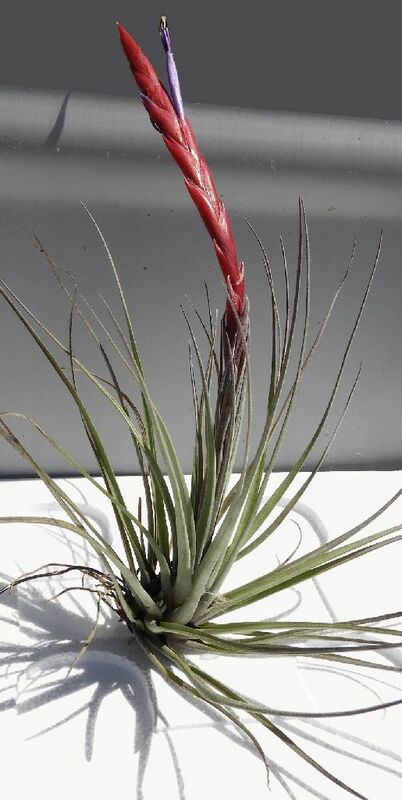 trelawniensis_a(Jamaica) trelawniensis_b(photo Peter Tristram) Now we are getting somewhere. With plants found in the Antilles each island seems to produce something different and a challenge. The DVD shows that the Germans think of it as T. aff trelawniensis. 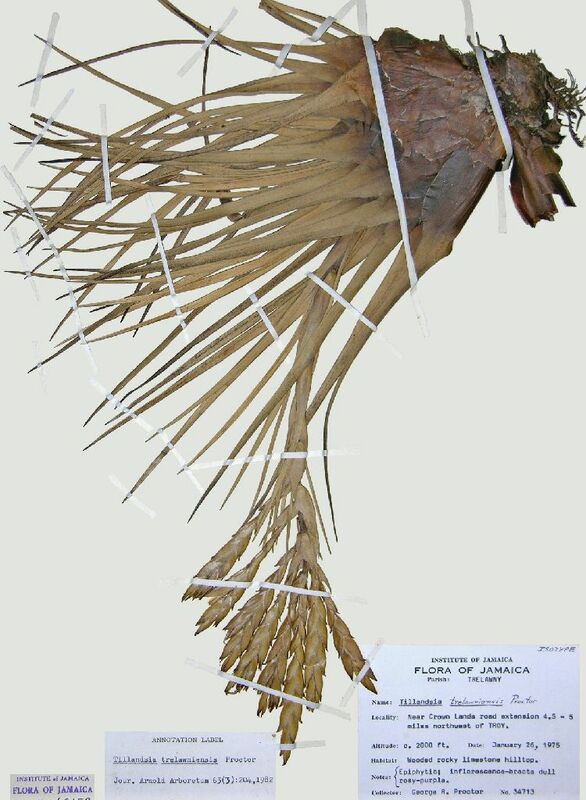 Shown below is what the Jamaican plant looks like and although not living gives an idea. My comment to Peter Tristram's 14/05/14 picture on Brom-L remains "My view is that the photo is of T. trelawniensis as surmised by Peter Tristram. I think Harry was initially wrong, especially if you check it against the description. Differential for T. rangelensis is with T. moscosoi !. Also Brian Sidoti and Kenneth Cameron at Monocots Conference 2013 treat T. trelawniensis as in the T. fasciculata complex but ignore T. rangelensis. 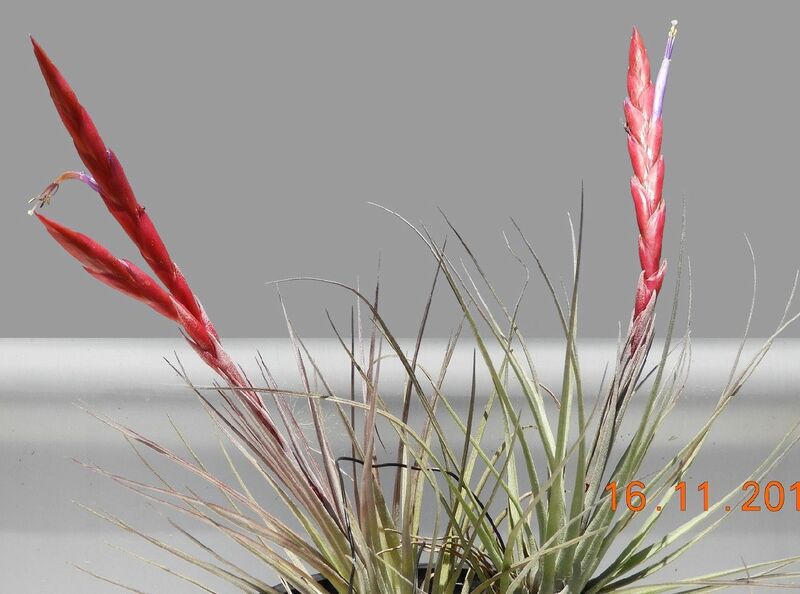 Greg Juones ... "rangelensis" on right showing a close comparison to T. fasciculata mini NR85 on left, with label ex. P.Tristram." Derek Butcher ... "We don't have a photo in the DVD of a live T. rangelensis. It is a recent discovery. Please tell us a bit more of its history and provide a photo on its own. I am also intrigued about the leaf sheaths." Derek Butcher ... "I have added it to my records with a query. The description tells me it is endemic to Cuba and it does not quite match. Perhaps Peter Tristram can expand on the "Dom. rep." connection. The Caribbean brings us interesting plants which are a devil to grow in Adelaide because of the climate. 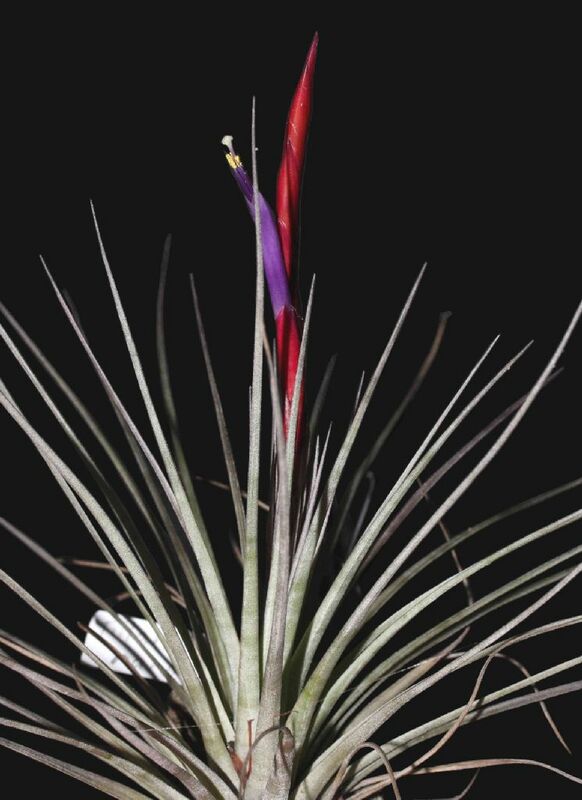 There are also several plants of the capitata clan from Cuba that have yet to be properly defined." Peter Tristram ... "Hi Greg. It has a long history of discussion. I抦 away again so will check my files on return. Basically the original of mine, not sure of Nev抯, came from Selby in 1988 when I first visited Harry Luther at the gardens. The plant was ex Dom. Repub. from memory. 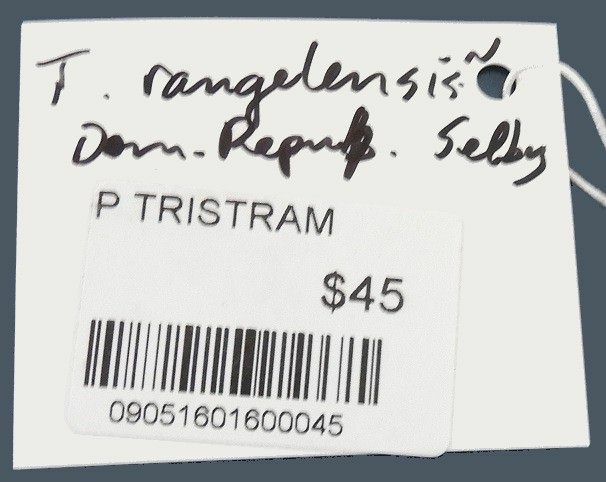 Years later, discussion revolved around T. rangelensis and T. trelawinensis. Without the DVD I can抰 check the types to remind me which one it is closest to. I hope the label is correct. One is like a fasciculata and the other more like a TV." 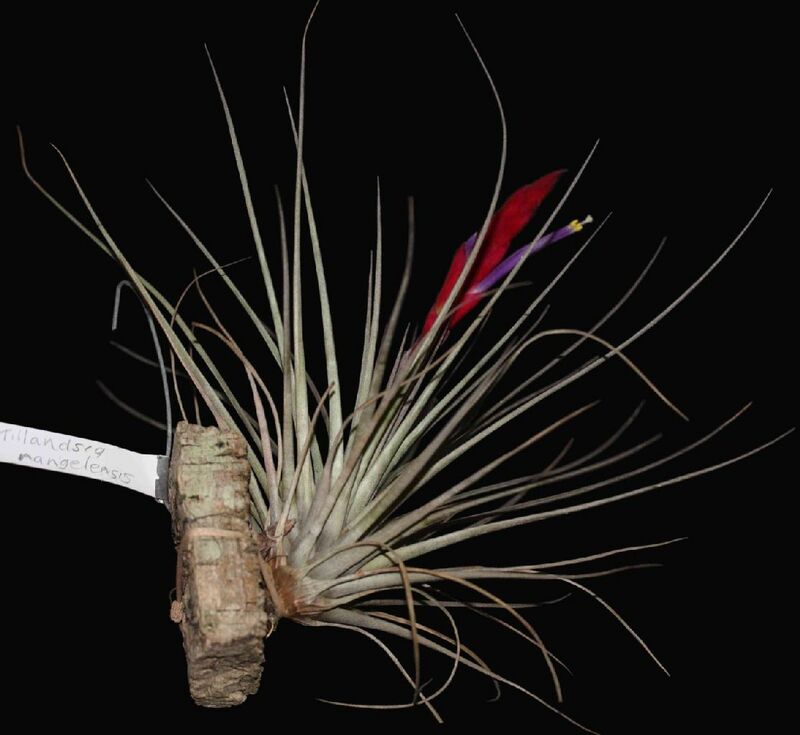 Greg Juones ... "Peter: I just checked the disc and both plants, yours and Nev's fasciculata 85, fits the aff trelawinensis." Type: Cuba-Pinar del Rio: San Cristobal, Paredon de Bartolito, Rangel, 22�'38,6"N, 83�'32,7"W, 540m, 3 act. 2005, L.Hechavarria, M.Canizares & B.Sidoti HAC-SV 44492. (Holotype: HAC; Isotype: HAC). A T. moscosoi L.B.Sm. & J.Jimenez foliis coriaceis, scapo curvato et sepalis posticis carinatis, connatis usque ad 3/4 longitudinem calycis differt. 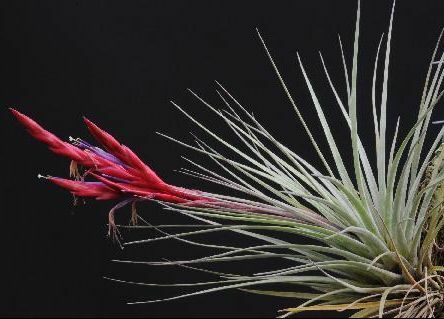 Plant epiphytic, growing in groups, 15-24 cm high when in bloom. leaf blades triangular, canaliculate, the apex acuminate, 15-20 x 1 cm. scape bracts imbricate, narrowly triangular, long acuminate, 5- 7 cm long, longer than the internodes. ovary 0.5 cm long, whitish. Etymology. Named in allusion to the type locality, Rangel, San Cristobal, Province Pinar del Rio, Cuba. Rangel is considered a classic recollection locality where the Brothers of La Salle had a country property where Bros. Leon and Alain, who wrote La Flora de Cuba (Leon 1946; Leon & Alain 1951; Alain 1953, 1957, 1964, 1969), collected a lot of plants. Comments. The species flowers in the dry season, in November. It appears to be endemic to Rangel and inhabits a semideciduous forest on limestone hills with abundance of Oxandra lanceolata Baill. (Annonaceae), the phorophyte where T. rangelensis was growing. 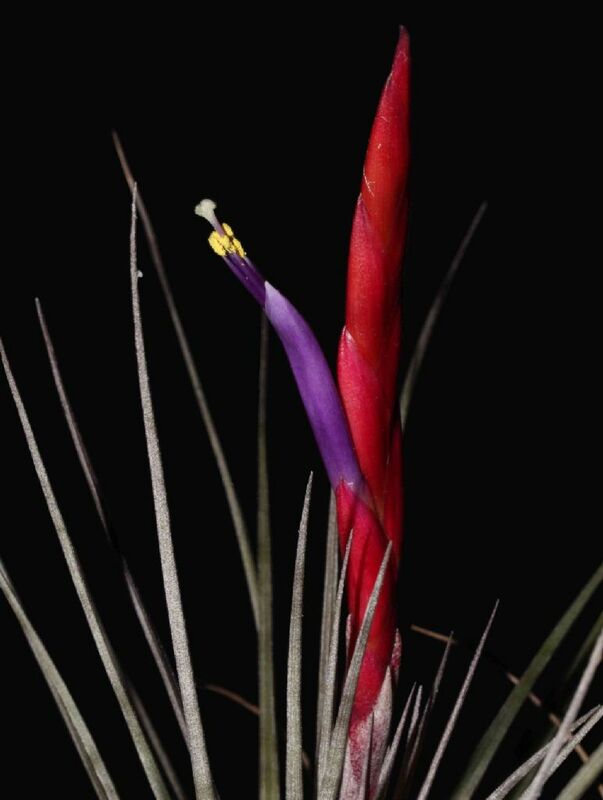 Other bromeliads found in the area were T. fasciculata var. uncispica Mez, T. fasciculata var. 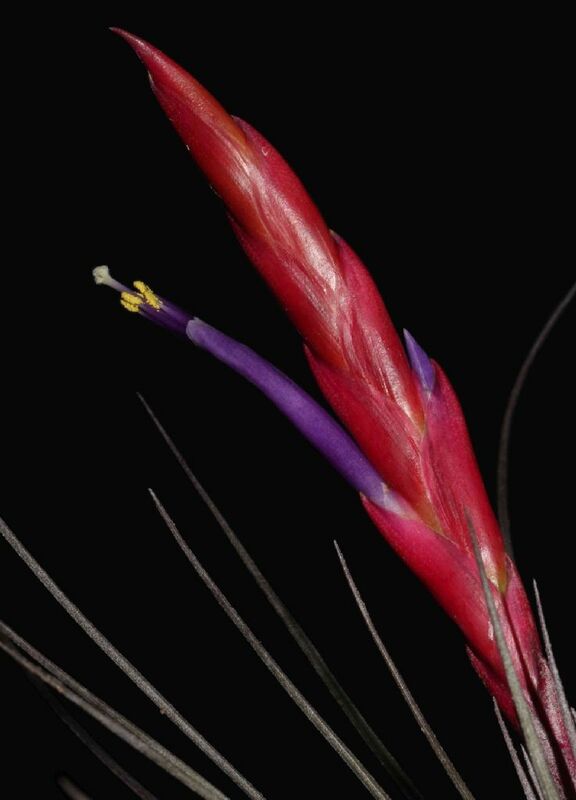 clavispica Mez, T. variabilis Schltdl., T. pruinosa Sw., Guzmania monostachia var. monostachia (L.) Rusby ex Mez, Hohenbergia penduliflora (A. Rich.) Mez and Aechmea nudicaulis (L.) Griseb. Paratypes. Cuba-Pinar del Rio: Paredon de la Jutia, Rangel, Dic.1957, Hno. Alain 6217 (HAC); Pinar del Rio: En la cumbre del de la Jutia, Rangel, 550 m, Dic.1957, Hno. Alain 6544 (HAC); Pinar del Rio: Paredon de Bartolito, Rangel, 22�'38,6"N, 83�'32,7"W, 540 m, 23 April 2005, L.Hechavarria, M.Canizares & R.Alonso, HAC-SV 42494 (HAC).